Great news -- each Tuesday, the outstanding Portsmouth Brewery will donate $0.25 from every bought beer to a charity of the patron's choice. 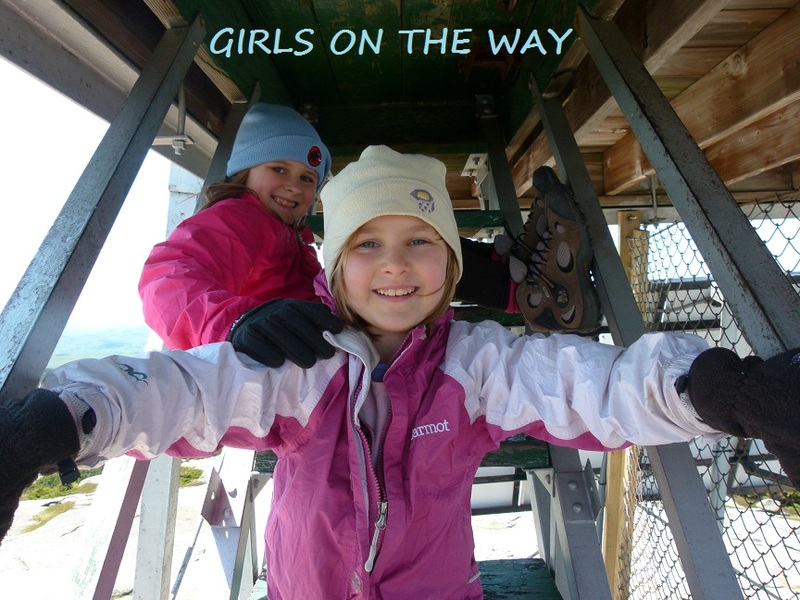 Choose us, "Girls on the Way," and the money will go to Global Fund for Women in our honor. So -- go visit the Granite State's "oldest original brewpub" and drink up! It's been too cold and windy to go above treeline lately. Our hikes last week consisted of 5-10 mile jaunts close to our home. Our time on such jaunts is improving -- we're averaging 2-3 miles an hour at a fairly relaxed pace. View of Franconia Ridge from the top of our local (big) hill. I previously wrote the girls and I are going to do 4Ks every week until we leave, but, after a bit of discussion, we decided against that. There are four specific 4K hikes we all want to do, but other than those four hikes, we're going to stick to long-distance roadwalks and hill-trekking. There are a couple of reasons for our decision. 1) From what I understand, there are only a few mountains we'll need to climb on the Camino. Most of the trek will be on paved or relatively smoothed-over surfaces (not snow, rocks, or roots). We've discovered path-walking is actually more difficult for us than mountain-trekking, since our muscles are used to the latter and not the former. Therefore, we're now including more paved/hardened surfaces in our hikes. 2) Winter 4K hiking is a big deal. Last year, Alex and I finished hiking all 48 of New Hampshire's highest mountains during calendar winters and, though I loved almost every minute of our quest, the worry and stress I carried on each and every hike was unreal. Winter 4K hiking is dangerous. The consequences of things going wrong during winter are almost always deadly. Alex is now the youngest person to have hiked all 48 of NH's highest mountains during the winter (she was 9 years, 2 1/2 months old when she finished last March) -- I was worried 7-year-old Sage would want to try to break her sister's record, but, thankfully, that doesn't seem to be the case. Sage is capable of doing the entire list, no doubt -- she already has 8 winter 4Ks under her belt, including the longer/more difficult peaks Carrigain, Garfield, and Isolation. However, she has no desire to ascend the likes of view-less East Osceola, Hale, etc. In other words, if there are no views to be had, then she doesn't see the point. That being said, there are four specific, absolutely gorgeous winter 4K hikes she/we would like to do before our Camino -- Mt. Madison, Mt. Monroe, Mt. Moosilauke, and Lincoln/Lafayette. Those four hikes are, in my opinion, the best of the winter 4Ks. They're also potentially dangerous, since each of those hikes requires a fair bit of above-treeline winter hiking. The temperatures and conditions have to be just right -- and we want views! While we're waiting for sunny skies and calm winds, we'll continue our 10-15 mile road-and-large-hill walks. The girls are set on their aforementioned packs. For a while, I thought I was going to buy a new one for myself, but then my car broke down and our downstairs heater finally died. I now have a heater that works and a brand new Subaru...while both these items were necessary, I hadn't planned on spending that much money this month (or next month, or the month after that). In other words, I can't afford a new backpack right now. and my backpack still had all its pockets and straps. There's really nothing wrong with my old one, anyway. It's a North Face Terra 40. Sure, the chest straps were eaten by a tight boulder cave on Mt. Percival and Hugh ripped a few holes in it the one time he borrowed it to climb Cannon. The mesh pockets are torn and a few of the zippers have been replaced with duct tape. It's been thrown down cliffs, tossed in deep snow, and dragged over a multitude of granite ledges. It also smells like a dozen AT thru-hikers since it hasn't ever been washed. Still. It's been with me since the beginning of all our adventures and I'm comfortable with it. I can always buy a new one in Pamplona if it completely falls apart along The Way. Hope everyone is having a wonderful New Year thus far. I'll post again later this week. I've been trying to organize our next trip, too. I can't be more excited since the family is really looking forward to it. We need to escape from the hustle and bustle of the city life.